How can I manage the noise my guitar is making? This is part 2 of our 3-part series on guitar pickup noise. This section describes some of the ways to solve or at least manage the noise you may be hearing from your guitar. Everything checks out – so how can I deal with the noise I’m still hearing? The easiest way to stop or at least minimize the 60 cycle hum is by using RWRP pickup sets and then putting your pickup selector in a middle position so that it runs 2 of your single coils together at the same time. By doing this much of the 60 cycle hum will at least be reduced. Before I switch to the middle position, is there anything else I can do to reduce the guitar pickup hum I’m hearing? 1-Dimmer switches and ceiling fans. If you have one of these on the same circuit you have your amp plugged into you will get a lot of 60 cycle hum. In fact, you can get so much that it will overpower your amp. Plug into another circuit! 2-Proximity to a neon sign. These can cause a lot of noise. Turn it off if possible. If you are playing in a venue where they want to leave it on, see if it can be moved – at least for a few hours. 3-Amp ground switch positioning. If you are using a vintage amp, and a Fender in particular, make sure that you have the ground switch in the correct position. Make sure to check the ground switch on you amp. 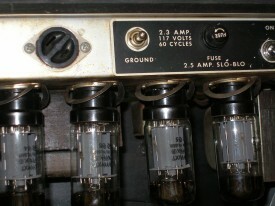 Your amp can be a source of noise if not properly grounded. 4- Proper outlet wiring. Believe it or not, I have found many miss-wired sockets in many different clubs. So checking your wall outlet can sometimes solve the problem – especially if you have ruled out all of the other more obvious causes. You can get a simple circuit tester at most hardware stores. When you plug it into the wall there are a series of lights that will tell you if the outlet is wired properly. These testers are only a few dollars and they will show you if the outlet is reverse wired. They will also show you if the ground in the outlet is connected or not. 5-When you are not playing, keep your hands on the strings. You can also roll the volume off all the way. So there is no “one size fits all” answer, is there? Generally speaking, minimizing noise with single coils is a matter of looking around and seeing what is causing the interference. If all else fails throw that selector switch into the middle position on a 2 pickup guitar, or in either the 2 or 4 position on a 3 pickup guitar. That is what an RWRP pickup is made for – that middle position is the hum-canceling position. I agree it’s not the ideal solution, but it does give you an alternative to bailing out on a bad situation.